Statistics regarding owner structure consist of owner structure distribution of holdings by sector and distribution of owners by sector. 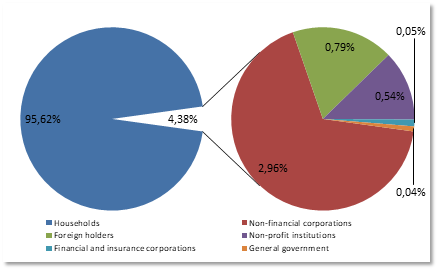 The following statistics shows the distribution of share ownership in sectors. Foreign ownership contains both holdings abroad and nominee registered holdings administered by Finnish custodians. Major institutional investors like employment pension schemes belong to general government. Sector codes are based on Classification of Sectors 2012 by Statistics Finland. 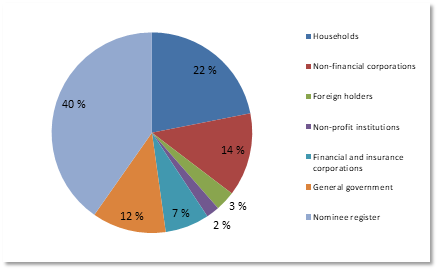 The following statistics shows the distribution of shareholders in sectors. Custodians administrating nominee registered holdings belong typically to financial corporations. Major institutional investors like employment pension schemes belong to general government. Sector codes are based on Classification of Sectors 2012 by Statistics Finland.